An entire level all your own is what Echelon on Palm offers as a new tempting choice among luxury Sarasota condos for sale. Scheduled to break ground in the latter part of 2015, this development has already pre-sold more than half of its planned 17 units as of March 2015, just a month after their market launch. This positive market response can be partly attributed to Echelon’s wonderful location at the corner of South Palm and Gulf Stream Avenues, one of the prime locations in downtown Sarasota. The condominium has taken over this one-third acre site from two bed and breakfast inns, the La Palme Royale and The Cypress. Echelon brings to this location a high rise estimated to cost about $50 million. This condominium is set for 18 floors, 15 of which are full-floor residential units designed with floor areas of 4,155 square feet each. Other choices of Sarasota condos for sale at Echelon include a half-floor unit with a living area of 3,079 square feet and a two-level 4,381-square-foot townhouse with a walk-up access to Gulfstream Avenue. The starting prices of Echelon units are quoted from $2.1 million up to nearly $4 million. Outstanding interior features await the future residents of Echelon. These include private elevator foyers and spacious open-air terraces with glass railings and tiled floors. The condominium units are all designed with impact-resistant and energy-efficient windows, nine-foot high sliding glass doors throughout, luxurious baths, and gourmet kitchens. Garage parking for the units will be at the first two floors of the building. 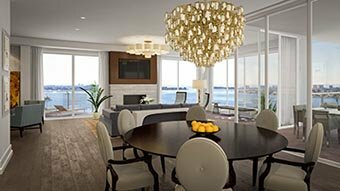 The upscale amenities designed for Echelon can rival those in the toniest of choices among luxury Sarasota condos for sale. The condominium devotes its third floor to a clubroom good for entertaining or simply relaxing. The floor’s facilities likewise include a fitness center with up-to-date circuit training equipment. Echelon’s yoga terrace and swimming pool with a spa are also set for this level, along with a well-furnished lounge deck with an al fresco grill and bar. As inviting, an expansive rooftop terrace will allow a complete appreciation of the magnificent views at Echelon. With this terrace, the condominium’s would-be residents will be able to enjoy a 360-degree panorama which encompasses not only the bayfront and the downtown but also the wonderful palette of colors of the Selby Botanical Gardens just south of the condo tower. All told, Echelon is out to create a strong impression in the market for Sarasota condos for sale. It has an architectural personality all its own, flaunting vast glass walls and luxurious interior appointments. This condominium is shaping up as a showcase in advanced coastal construction and design. Its developer, the Ronto Group is deploying all the know-how it has gained for more than 40 years. The company’s track record includes building over 10,000 tower residences and 2,000 single-family homes. An award-winning company, Ronto has also tackled development for shopping plazas and a resort hotel. Ronto has developed properties in Texas, Toronto, and in the east and west coasts of Florida, with Echelon as its first project in Sarasota.